Westley Shearman is working to find the right balance between humorous and emotional pieces for the show. Queer Monologues brings the voices of Emerson’s LGBTQ community into theatrical space. The show features a variety of humorous and dramatic monologues, speeches, and poems. Queer Monologues first came to life on stage last year with one production date, while this year’s show will have two production dates as EAGLE wanted to give people more opportunities to attend the show. Like last year, writing submissions and performance auditions were open to interested students. Westley Shearman, a sophomore visual and media arts major and EAGLE’s public relations and marketing representative, will be co-directing this year’s show with Dylan Walton. Shearman is working closely with cast and crew members to mix up the humorous and emotional performance pieces. Shearman said that there is a certain mindset people have when going into LGBTQ-inspired performances, but the show will deviate from those expectations. This year’s show retains the format and organization of last year’s, one monologue performed after another, but Shearman said he and the Queer Monologues team are working to highlight the emotional messages muffled last year by having performers enact the pieces they enjoy or relate to. In order to have this emotional connectivity, the directors, stage manager, and book editor met to carefully pick out writing submissions. Spencer Wright, a freshman visual and media arts major, submitted one of the pieces that will be performed at this year’s show. His piece centered around how young gay men are often overwhelmed and unprepared to deal with coming out. Wright, an EAGLE member, relays that his participation in the Creating Change LGBTQ Empowerment Conference in Philadelphia inspired him to audition for Queer Monologues. During the conference, Wright heard more about the production from the EAGLE members and excitedly wanted to submit a piece and perform. 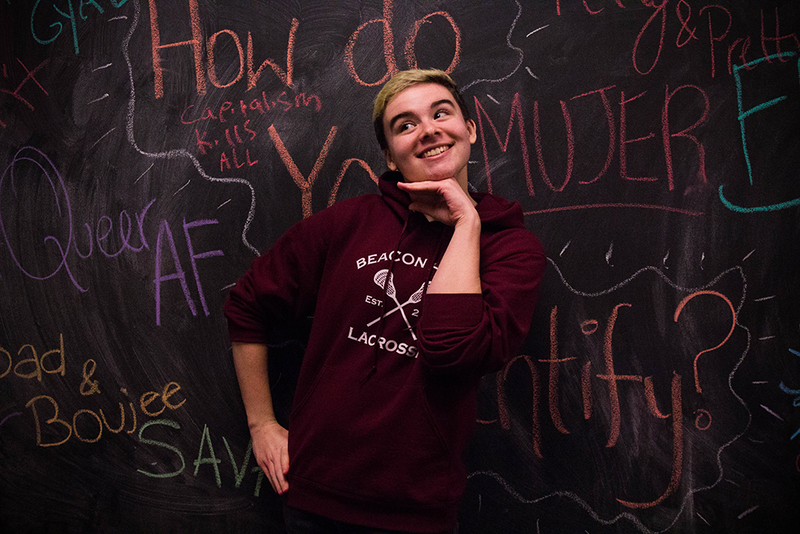 Casey MacPhail, a junior visual and media arts major, and José Ramírez Barceló, a sophomore visual and media arts major, performed at last year’s Queer Monologues and will return as participants this year. Barceló relayed that the show aided their process of coming to terms with being agender and said that it is important to keep putting on LGBTQ based shows. Though some of last year’s pieces will be performed at this year’s show, MacPhail said that the other new pieces and new cast will bring fresh perspectives and a completely different show. Like Barceló, performing and watching people perform in the first Queer Monologues became an expressive outlet for MacPhail, encouraging him to take to take part again. The show will be held on the evenings of Feb. 28 and March 1. Shearman said that those interested in gaining insight into the raw experiences of the LGBTQ community should come to watch.